Chandeliers are a great interior lighting option if you’re looking to add a sense of elegance to a room. They look good just about anywhere — over your dining room table, above an outdoor patio, hovering over your bathtub. At M&M Lighting in Houston, we offer a large chandelier selection, ranging in sizes and styles. If you have any lighting needs, contact our team of specialists today! 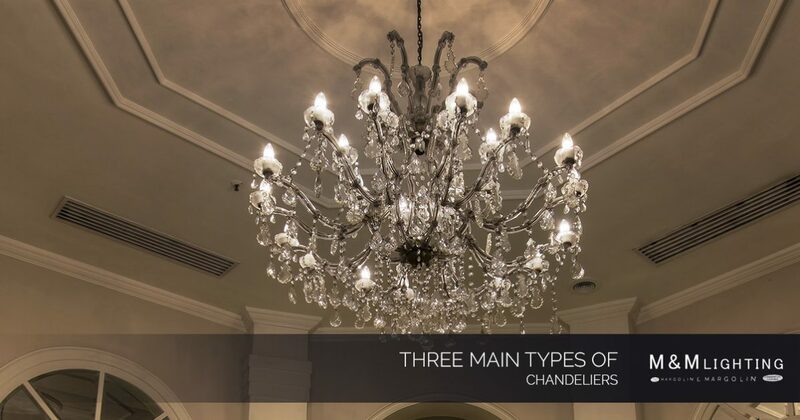 Here are the three main types of chandeliers we offer at M&M Lighting, all of which offer a sophisticated, bold focal point to an area of your home. We offer large, medium and mini sized chandeliers, and we offer dimmers for our chandelier collection as well! Crystal chandeliers are a common type of chandelier, boasting intricate lighting designs made out of crystals. They’re luxurious by nature and come in several sizes and finishes. They also come in different designs, such as candle, sphere, starburst, or with the glass facing up or down. These types of chandeliers are made to impress and are usually installed into more formal areas of your home, such as your dining room, entryway or foyer. Shaded chandeliers have shades covering the lightbulbs in the chandelier’s design. These shades add a dimmed effect to your home’s room, and the shades can cover individual lights or multiple lights at once. These types of chandeliers look best in your bedroom, office or bathroom due to their softening and calming effect. Depending on the angle of the chandelier, or the thickness of the shades, you can customize your chandelier’s lighting to be soft, medium or heavy. Shaded chandeliers can also fit any home’s style — contemporary, rustic, traditional and more! We also offer mini shading options for chandeliers! These chandeliers are obviously placed outdoors, and they usually have multiple lights on one suspension chain or cord. They can add curb appeal to your front porch, or they can be used to highlight your backyard’s seating area. Outdoor chandeliers add a taste of sophistication to any home’s exterior! At M&M Lighting, our team of lighting specialists knows everything there is to know about lighting, from design to functionality. You can count on our professionals to find you the perfect chandelier that fits within your budget. We have been a top distributor for lighting fixtures and ceiling fans in the greater Houston area for more than 50 years.